I can't front, I've been hearing about Gangreen for a minute and never bothered checking them out. Which is bugged cause Alchemist is my 2nd favorite producer over the past 12 years. But for some reason I never checked for him and Oh No's group. Probably because I'm not a HUGE fan of Alchemist rhyming and to be honest, I know absolutely NOTHING about the dude Oh No except he's Madlib's little brother. So you put those two facts together and that's why Gangreen's never got any run over this way. Plus with my new millennium music philosophy that if something is dope enough that it'll get to me and since NO ONE has ever got at me on some ole "you don't know what you're missing with this Gangreen" I figured I was good. That is til I checked out their new album "Vodka and Ayahuasca." 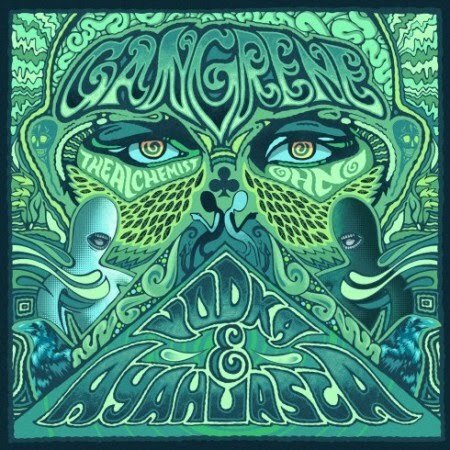 So what made me check out Gangreen's new album if I've never checked for them before? Probably timing. Right now, there's not really any new music out and I wanted to hear something new and it was the only thing that's dropped since the New Year so I figured I don't have nothing to lose. I was trying to find a way to explain the sound of "V & A" when I heard Oh No spit "this is a acid trip/rancher spit/psychedelic cancer with some packs of sh-t" to set off the title track "Vodka and Ayahuasca" and that basically sums up the album right there. This album's sound is a mixture between some acid psychedelic type ish. I've explained beats numerous different (sick, bananas, crazy, etc.) ways usually depending on the producer and how the MC's spits on it but the only word that comes to mind throughout the entire album is "disgusting." These beats are disgusting and trust me, they're disgusting in a VERY good way. "V & A" sets off with "Gladiator Music" featuring Kool G. Rap and has Oh No setting the album off lovely with "I'm a gladiator/I'll grab a hater like al-qaeda/pray to your savior and meet thy maker/I'll rain razors/stain pavements with brains hanging/like Wes Craven/made it West favorite/flagrant I'm foul/the foul mouth faded/Cali wild style of sparring/rip apart ya'll/like 300 Spartans and 2 arsons"...SMDH, and I haven't been checking for this dude? I must be the one that's high out my mind. The beat for "Flame Throwers" is STUPID and has Al and Oh No going in but again it's Oh No who steals the show with lines like "see me, I'm a pot smoker/I cannot be sober/I'm a lye soldier/locked in a cockpit, leaned over/corrupt ambition/air force of the old novas." "Drink It Up" featuring Roc Marciano makes you instantly scrunch up your face cause of the beat and these dude's rhymes mesh with these beats like they're cut from the same cloth. "Auralac Bags", "Due Work" and "Odd Cracked" all fall in line with the disgusting (there's that word again) bangers I've already broken down and when Prodigy and Evidence check in on "Dump Trunk" and "Dark Shades" they both helps to keep the party going. To be honest and I hate to say it, the only downfall on "V & A" is Alchemist's rhymes. It's so apparent that money is not a MC. He's a producer who can drop a good 16 here and there but when you put him next to Oh No and other MC's for an entire album it's apparent money don't belong. But even Al's lyrical shortcomings can't stop this album being the banger it is. But like I said earlier, that there was nothing to lose with checking out "V & A" and I was right, there's ABSOLUTELY nothing to lose but a whole lot more to gain.